Artwork Panel: 128.5cm x 64cm ≈ 50½" x 25¼"
Silk/Brocade Border: 148.5cm x 74cm ≈ 58½" x 29"
The artist was trying a new style of tiger painting here. If you like his new style, buy this. This painting is one-of-a-kind! 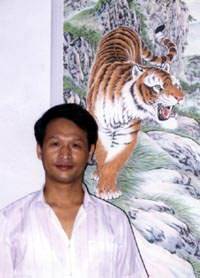 The Chinese Tiger represents the king of all animals in Chinese culture (Just as we see the Lion as the king in western culture). The tiger is often seen as the Chinese symbol of strength and power. Chinese people have taken this association a step further by claiming that tigers have the symbol of a king on their heads. If you have ever looked at a tiger face to face, you will see the fur on the tiger's head is in a similar shape to this "Wang character". Take a look at this painting and see if you can find this on the tiger's head. If you aren't Chinese, it might take a little imagination to see the symbol, but anyone who speaks and writes Chinese will tell you that it's true. This is an "elaborate style painting" It is done with a lot of detail and a very fine brush. Each stroke is meticulously applied. This technique takes a long time for the artist to complete. 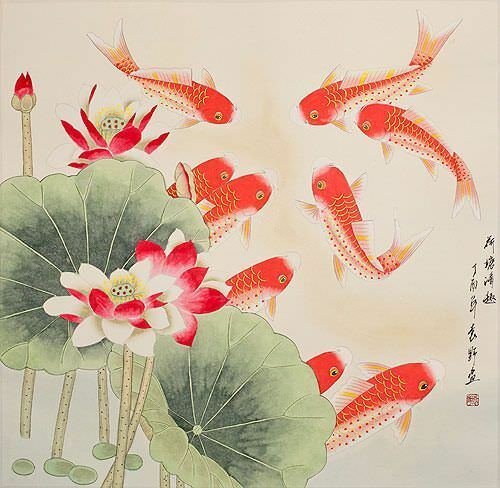 This was painted with special Chinese black ink and watercolors on xuan paper (often incorrectly called "rice paper"). The artwork was then mounted with a silk brocade border, and is ready-to-frame when you receive it. The artist of this work is (Yin Yi-Qiu). He was born in Zoucheng in the Shandong Province of Northern China. Nearing age 50th, he has been painting for more than 30 years. He studied various media and styles of art such as watercolor, gouache, and oil painting in a variety of landscapes, birds, and flowers. But in the last few years, tigers have become his passion. In fact, tigers are the only thing he paints these days. I am not sure how many of these I will have in the future because his work is getting very popular, and soon will be out of my price range. You see, recently he has been very busy with a series of major art exhibitions at upscale art galleries in Guangzhou (not far from the Hong Kong border) and other places in China.